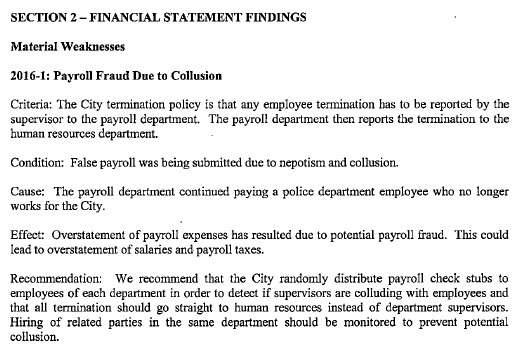 To understand how the auditors came to their conclusion the Payroll Fraud involved collusion is to understand how the City processes its bi-weekly payroll. It is also clear that certain personnel actions taken by new Mayor Mike Favre directly relate to what I think the FBI really told him and the City Attorney a couple of months ago. Slabbed is continuing the quest to establish communication with Ms. Denardo. She is certainly aware Slabbed is actively investigating this topic. We are also always ready to speak with current or former employees that can shed more light on this topic. I have reason to believe the FBI has closed it file on this matter because the amounts involved here are chump change for a federal prosecution among other reasons. That does not mean local law enforcement is powerless to prosecute here but ultimately our District Attorney would have to step up. There is no evidence that would indicate DA Joel Smith has any interest in this matter. This is the set up piece for what is to come and now I urge caution on those of you moved to comment. A man is dead and his family is still grieving. I do believe Attorney Favre when he said the FBI cleared Patricia Denardo for reasons I’ll reveal later. In linking the applicable statute it should also be clear that some of those that knew what was happening and did as they were told could not meet all of the crime’s elements and in that context I’d caution against labeling City employees as crooks because such would be a good way to get yourself sued. The truth is bad enough folks. Unfortunately is also clear that the aftermath of Mike Denardo’s last crime includes those with the least amount of culpability suffering some of the harsher consequences and we’ll be endeavoring to tell that story too. Slabbed has confirmed the identity of Sheriff Adam’s tipster with multiple sources with knowledge of the investigation and it makes so much sense we all should have figured it out on our own. By way of a hint I’ll add if an organization that maintains general counsel discovers a crime, it would naturally fall to the General Counsel to contact Law Enforcement. I end this post with a three dates: August 17, 2016 which is the date of the last paycheck issued in Ms. Denardo’s name, August 31, 2016 which was the date of Chief Denardo’s last paycheck and September 8, 2016, which was the day then Chief Denardo took his own life. Those dates are important because it tells us that sometime between August 18, 2016 and August 31, 2016 Sheriff Adam was contacted about the payroll fraud. Next up Slabbed presents some documents and we drill down on those 65 paychecks, then we marry what we’ve found to a timeline of events that will lead everyone to some very disturbing, inescapable conclusions. Stay tuned. Wow! Great job drilling down to the root and nerve. Unfortunately, that is where the worst pain is. Even those of us who lack your financial and investigative expertise are scratching our heads at the suggestion that this scheme was a one man band!! Wow. Great work Doug. I hope all who new about this and did’t tell anyone gets what they deserve. Thank you for your hard work. The last group had the decency to steal from us and hide it well. This bunch raised taxes, fees, utilities then gives it to some museum that’s one man’s family dream and puts speed bumps at certain houses. They are bold. Les would have done a great job with that extra million a year. It would have offset the stealing. The DECENCY to STEAL and HIDE IT WELL!!! To make those observations, and all in one warped sentence, tells it all. Another proud Les “groupie” equating crime with “decency” as OK! The reason for you being an X employee is quite obvious. You don’t know right from wrong. Before all of this is over, you just might have to come out from under that rock and ‘splain yourself! 2008-2012 Les capades of lies, deception and giveaways! Spin da wheel on who wants to be or don’t want to be City Clerk! 2013 Council: SHOW US THE BOOKS, DOJ MONEY! State audit, Police Dept. investigation, cash balances shown, payroll fraud uncovered, ATF, FBI inquiries, bye Raff, Jerome and Sir Charles, Building Dept. better!!!! 2013 gift to 2017 Council: a better, sounder, transparent BSL with Les’ baggage for most part paid and cleaned up.. 2017 -2020…. Douglas! Can you imagine this kind of fraud and misappropriation of funds in s private sector business? When the hammer comes down in the private sector for screwing with the company’s money, the perpetrators have to lawyer up cause it’s coming down on them. Les will ultimately get a pass on his mismanagement. No doubt he knew the circumstances at the PD. They were the LesBI! Leave from work unaccounted for, unearned overtime to out right payroll fraud, illegal raises etc. he tried to buy employee support! Alice Mosely needs to be put in a museum not be one. They moved to the Depot because their real property value didn’t justify her display financially! Now they are taking the tax payers property as it is deemed to be less valuable? WOW! Raise Taxes then give it away! When Tourism stops getting Alice Mosely grants are they going to get free rent? Nothing is never thought out and put to rational thought. Les will get off and us taxpayers will continue to pay…. Doug? Ms. Lana? I heard that Tourism has never paid rent or utilities for 20 years but we pay all expenses! Is this so? I think Les will indeed get off. No, Happy, that is not accurate. Alice Moseley has paid rent for the last 4 years at least at $800 a month. They (Mosely)should pay rent because their draw is not enough to justify otherwise! It has never been the job of elected officials to decide who to give away things t0. If it was profitable Mosely would still be in their own facility instead of using it for other purposes that make better financial sense. They claim grants etc. Tax Payers fund those grants and Tourism gets them the grant. We cannot reward nonprofits for doing what we grant them non profit status to do! Tourism is actually an unheralded supporter of all Tourism related events with endless hours at low pay providing support to nearly any viable event. They in fact get the Grants for Alice Mosely. Tourism is quasi government because it is funded by hotel taxes and legislated by the State as a part of our support system. They don’t photo op and tout themselves as saviors and end all organization. They just stay involved and help where ever needed. For example, the grants for the Mosely Museum. Promotional help for many events and unlike the Chamber, they don’t ask for anything. I believe BSL is only City that contributes to them. Les should get off, when he was in office the Bay got: a much needed grocery store, a 25 million dollar marina, a revised downtown, gravel was put on roads in 5&6 regularly, new pavement threw out the city, a duck pond, hundreds of trees planted, new street lights, our first latter truck, a much needed new pumper truck, several new police cars,new heavy equipment, a new community center,a new garden center, rebuilt the depo, and millions in New infenstructe work. Just to name a few. He rebuilt the Bay with a lot less money than is flowing now. Keep notes the next 3 1/2 years and compare. Less did not “get” those items. FEMA money paid for most of them, including the downtown. 200 North Beach, Trapanis, The Bay Town Inn, and Chet’s condos were are paid for mainly with FEMA $ and CDBG $. The tress were donated. He is a part owner of the grocery store. Don’t kid yourself. His pockets are well lined. Rachel, I hope you have proof of what you just stated…Part owner of the grocery store? Prove it. City worker, you must be smoking spice or cheap weed. Les is a fake, a fraud, his promises are as worthless as his $3 bills. He has scammed more people than Bernie Madoff. And he would have raised taxes to the max and bankrupted the city if not for hardass councilman. Stupid is what Stupid types on Slabbed!! And the community center was a Rotary donation. At least memories are not short. He will run again. Rhonda G said she was a king maker getting her people in and Les will rule again if memories are 2 short! Let him run, folks are keeping files of his and Rappingraff proven escapades and downward spiraling of BSL. All the criticism of Boudin, Falgout and Favre’s fighting, disclosing, auditing and battling of Les and Raff all became true. Boudin and Falgout lost, Favre in Mayor’s Office. BSL won because of these three. Now let’s hold this Council accountable and BSL wins again. Previous Previous post: Barry 2020!! !